Fred J. Fresard, a highly experienced trial attorney, focuses his practice on defending complex, high exposure litigation in the United States and Canada. He handles class action, product liability, Multi-District Litigation, and other commercial and negligence cases across North America for numerous multinational corporations. Mr. Fresard is regularly called on by Fortune 500 companies to try high stakes cases in some of the toughest venues. In addition to handling significant cases and trials, Mr. Fresard also advises clients on issues outside the context of litigation, such as risk management, business matters and contract negotiations. 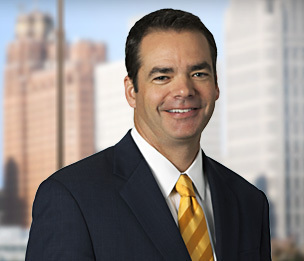 Over his 20-plus year legal career, Mr. Fresard has helped his clients manage hundreds of millions of dollars of exposure in class action, product liability and other litigation-related matters. He has coordinated litigation for large manufacturers and insurers, and has tried dozens of high exposure cases against some of the country's top trial attorneys. His clients typically conduct business on a global scale, so Mr. Fresard has examined and presented witnesses from the United States, Canada, Germany, the United Kingdom, Japan and Korea. He serves his international clients across the North American continent, having appeared in dozens of courts throughout the United States and as a licensed barrister and solicitor with the Law Society of Upper Canada. Mr. Fresard serves as national and local counsel for several global manufacturing enterprises. While he is often called upon to take high exposure matters to trial, he also provides product liability avoidance advice, including design review and development of warnings, manuals and brochures. Mr. Fresard is also retained to consult on safety and regulatory matters. Mr. Fresard is a highly regarded lawyer in the area of automotive crashworthiness litigation, safety technology and safety regulation. He is well-known for his technical expertise, especially in the area of vehicle handling and stability, roof strength and occupant restraints. Mr. Fresard also has considerable experience in legal and regulatory issues facing industries in the alternative and renewable energy sectors. He has represented the energy industry in significant litigation related to renewable power supply development and is recognized for his expertise on legal and regulatory issues related to hybrid and electric vehicle technology. Mr. Fresard also represents internationally-known clients in the motion picture and professional recording industry. He handles transactional and litigation matters relating to recording and motion picture contracts, as well as disputes over misappropriation and unfair use. Klassen v Trent, Wayne County Circuit Court, Detroit, MI (2018). Trial counsel for defendant driver in wrongful death claim involving a collision between an SUV and a motorcycle. Plaintiff requested over $9 Million in damages at trial. Defense verdict. Migdalewicz v. Hollie, Oakland County Circuit Court, Pontiac, MI (2018). Trial counsel for defendant driver in claim that driver caused a motor vehicle/bicycle collision, causing leg, back, neck and brain injuries to the bicyclist. Defendant admitted liability. Defense verdict. Daniel, et al., v. Ford Motor Company, USDC for the Eastern District of California, Sacramento, CA (2018). Trial counsel for defendant automaker in certified consumer class action claim that all class vehicles had a rear suspension design defect that led to premature tire wear. Defense verdict. Ybarra v. Ford Motor Company, et al., Wayne County Circuit Court, Detroit, MI (2017). Trial counsel for defendant automaker in claim that driver of company car caused a motor vehicle/bicycle collision, seriously injuring the bicyclist. Defendant admitted liability. The jury awarded no damages. Saiyed v. Ford Motor Company, et al., Washtenaw County Circuit Court, Ann Arbor, MI (2016). Trial counsel for defendant automaker in claim that driver of company car caused a motor vehicle collision, seriously injuring three occupants of another vehicle. Defendant admitted liability, and plaintiff requested that the jury award over $6 Million in damages at trial. The jury awarded no damages to any of the three plaintiffs. Tompkins v. Northwest Airlines, USDC for the Eastern District of Michigan, Southern Division (2012). Trial counsel for defendant airline in claim that building design defect caused a hazardous condition resulting in significant spinal injuries. Plaintiff requested $4.7 Million in damages at trial. Jury found for plaintiff, but awarded only $1,439.46 in damages as to Northwest Airlines. Nemmers v. Ford Motor Co.,USDC for the Southern District of Iowa, Davenport Div., (2011). Trial counsel for defendant automaker in claim that seat belt design defect in automobile caused quadriplegia. Defense verdict. Schaefer v. Ford Motor Co., Wayne County Circuit Court, Detroit, MI (2010). Trial counsel for defendant automobile manufacturer in claim that defect in vehicle electrical system led to fire and destruction of place of business. Defense verdict. King v. Ford Motor Co., Allegheny Court of Common Pleas, Pittsburgh, PA (2010). Trial counsel for defendant automobile manufacturer in claim that vehicle was unstable and uncrashworthy, causing plaintiff's quadriplegia in rollover crash. Settled during trial. Poehler v. Ford Motor Co., Sibley County District Court, Gaylord, MN (2009-2010). Trial counsel for defendant automaker in claim that vehicle was unstable and uncrashworthy, causing plaintiff's paralyzing neck injury in rollover crash. Defense verdict. Gessling v Ford Motor Co., Boone County Circuit Court, Columbia, MO (2009). Trial counsel for defendant automaker in claim that vehicle roof was not crashworthy, causing fatality and injury to the occupants in rollover crash. Defense verdict. Shaver v General Motors Corp., Riverside County Superior Court, Riverside, CA (2008). Trial counsel for defendant automaker in claim that vehicle was not stable and had inadequate roof strength, resulting in quadriplegia in rollover crash. Settled during trial. Theodoroff v. General Motors Corp., Wayne County Circuit Court, Detroit, MI (2007). Trial counsel for defendant automobile manufacturer in claim that defect in vehicle suspension system resulted in multivehicle crash and traumatic brain injury. Plaintiff's verdict. Grimes v. Ford Motor Co. (re-trial), 15th Circuit Court, Palm Beach, FL (2007). Trial counsel for defendant automaker in claim that vehicle seats were defectively designed, resulting in quadriplegia in rear impact. Plaintiff's verdict. Schulze v. General Motors Corp., Ingham County Circuit Court, Lansing, MI (2006). Trial counsel for defendant automaker in claim that vehicle cruise control was defectively designed, resulting in unintended acceleration and crash. Defense verdict. Long v. Polaris Industries, Kalkaska County Circuit Court, Kalkaska, MI (2006). Trial counsel for defendant recreational vehicle manufacturer in damages-only trial where plaintiff claimed traumatic brain injury resulting in significant lost business income. Jury awarded less damages than requested by plaintiff. Grimes v. Ford Motor Co., 15th Circuit Court, Palm Beach, FL (2005). Trial counsel for defendant automaker in claim that vehicle seats were defectively designed, resulting in quadriplegia in rear impact. Hung jury. Potter v. Ford Motor Co., Cumberland County Circuit Court, Crossville, TN (2005). Trial counsel for defendant automobile manufacturer in claim that vehicle seats were defectively designed, resulting in quadriplegia in high speed rear impact. Plaintiff's verdict. Kohutek v. General Motors Corp., Bexar County Circuit Court, San Antonio, TX (2004). Trial counsel for defendant automaker in claim that vehicle roof was defectively designed¸ resulting in quadriplegia in rollover crash. Defense verdict. McBride v Mitsubishi Motors Corp., Wayne County Circuit Court, Detroit, MI (2004). Trial counsel for defendant automaker in claim of defect in vehicle suspension system, resulting in rollover crash on German autobahn and traumatic brain injury. Defense verdict.